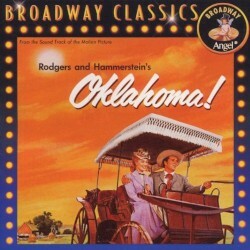 This is the original soundtrack to the hit movie Oklahoma, which was originally a theatre production. Annotation last modified on 2016-01-23 18:00 . EMI Music (do not use as release label! this is a music publisher), EMI Music Publishing Ltd., Rodgers and Hammerstein Theatrical Europe Ltd., Williamson Music Company and Williamson Music Ltd.